Since its sudden and dramatic formation upon winning the competition to design Paisley Civic Centre in 1963, Hutchison, Locke and Monk (HLM Architects) has consistently served and adapted to the changing requirements of Britain’s welfare state, and has instinctively dedicated its professional services to community architecture. Conceived from the perspective of founding partner Tony Monk, this book reveals the inside story of how the partnership has grown over 50 years to become a leading UK national practice. It sets out the early influences and progressive design philosophy of HLM Architects and analyses how they developed their design ethos from late-modern through contextual post-modern architectural styles by the early 1980s, and then matured into producing its own contemporary designs, explaining why these changes took place over that period. As well as reflecting the transformations in the social and political landscapes and in aesthetic approaches, it also inevitably records the changing social history of the architectural profession from labour-intensive manual presentations using drafting pens and drawing boards, through to the slick mass-produced computer modelling that accompanied the digital revolution, and the fundamental adjustments needed to meet the realities of managing an efficient modern commercial business. Working with the HLM Board, the authoritative contributors are Directors who have used their knowledge and experience in responding to government legislation with innovative architectural solutions in their specialist fields. HLM Chairman Christopher Liddle is a leading exponent of defence and custodial procurement, alongside Caroline Buckingham in education and Leslie Welch in healthcare. Their award winning projects now help formulate current policy. The critical Introduction by Dr Edward Denison re-examines the practice’s philosophy and contribution to the evolving welfare state during the second half of the twentieth century. The conclusion is a perceptive assessment of the future direction of the architectural profession and a statement of HLM’s continuing commitment to improving our society. The complex relationships described shed new light on previous architectural theories and, in doing so, this book adds to the knowledge of post-war British architecture. Foreword Sir George Young. Introduction Edward Denison. Prelude Tony Monk. 1. Civic Tony Monk. 2. Healthcare Leslie Welch. 3. Residential and Mixed Use Tony Monk. 4. Defence Christopher Liddle. 5. Custodial Christopher Liddle. 6. Education Caroline Buckingham. The Next Generation and the Future Christopher Liddle. Current HLM Board 2017. Project Lists. Awards. Acknowledgements. Contributors. Index. 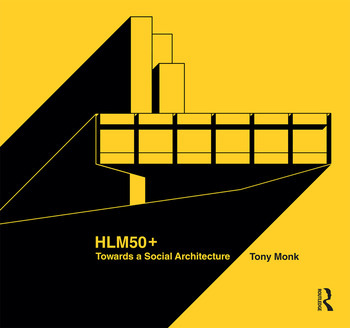 Professor Tony Monk is an architectural practitioner, an educationalist and an author. He graduated from the Bartlett School of Architecture, London and obtained a master’s degree from Yale University where he was a contemporary of Lord Norman Foster and Lord Richard Rogers. He was a founder and joint senior partner of Hutchison, Locke and Monk (now HLM Architects) who are a national architectural company renowned for their healthcare work. He was the first Head and Professor of Architecture at the University of Bedfordshire, where he helped to secure RIBA recognition for their new architectural degree. He was the author of two books, The Art and Architecture of Paul Rudolph, being the biography of America’s late modernist, and subsequently Hospital Builders, which is a definitive publication on healthcare design and management. Formerly an advisor to the Sports Council lottery panel, a non-executive director of the Building Centre and a founder director of the Acton Housing Association, he is now an elected Governor of the new Frimley Health NHS Foundation Trust.